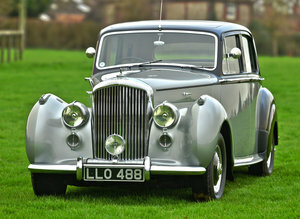 1947 Bentley Mark VI Windovers DHC. Chassis number B108AK was completed in August of 1947 to the order of Sir Alexander Rogers KBE. 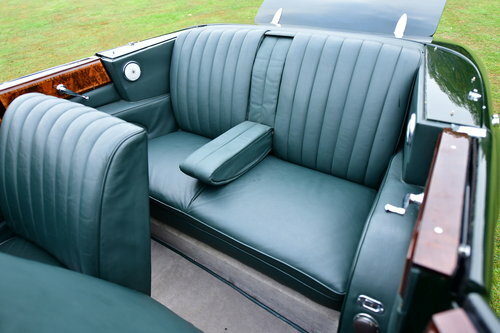 The Bentley was bodied as a drophead coupe by the respected coachbuilding firm of Windovers. Founded in 1856 in Huntingdon but from 1924 based in North West London, Windovers diversified into the manufacture of motor bodies in the early 1900s, concentrating on quality marques – chiefly Daimler and Rolls-Royce at first – before adding the likes of Alvis, Armstrong-Siddeley, Lagonda, Lanchester, Mercedes-Benz, and Bentley to its portfolio in the 1930s. 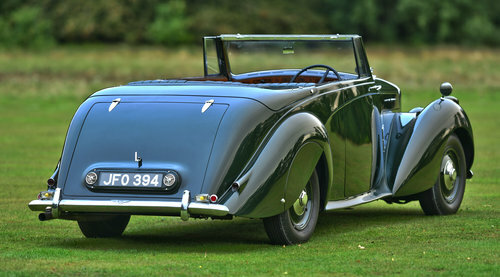 The coachwork is believed to be unique, with a disappearing hood design, concealed when lowered by a panel of folding coachwork, which is secured with a coach key. It is understood that this particular body - number '6645' to Design '101' - is one of the last, if not the very last, built by Windovers. B108AK changed hands in 1950 when purchased by Brook Tool Ltd of Birmingham, and then again in 1952 when purchased by R and W H Symington Ltd of Market Harborough. It was acquired in 1958 by Mr R V Fontes of Knutsford in Cheshire, and at some time in the mid/late 1980s was sold by David Baldock, as a restoration project, to Merrick Edwardes. B108AK had been in Canada for many years, was complete in every respect but needed a full restoration. Merrick Edwardes intended to restore the Bentley for his own use, but after a great deal of persuasion sold the car to Peter Channing and restored it for him during the early 1990s. The bills associated with the restoration are eye watering to say the least. 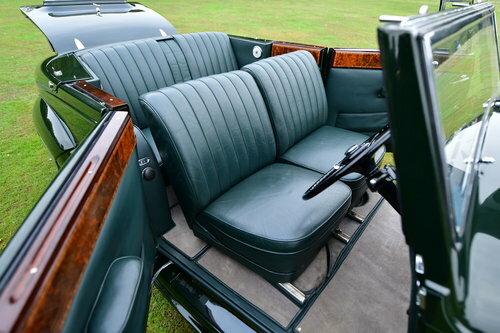 This thorough restoration included a new ash frame, coachwork restoration, brightwork restoration and re-plating, a new hood and interior, and also extensive mechanical works. 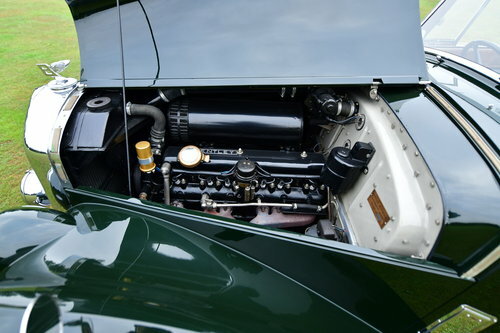 Mr Channing also wanted to upgrade the car with a 4½-litre Bentley R-Type engine and automatic transmission (the original engine had a cracked block and was unserviceable). A donor R-Type was purchased (chassis number 'B236WH') and the engine, gearbox, and steering column were removed, overhauled and fitted to 'B108AK' as per Mr Channing's instructions. At the same time the engine was modified for increased power and torque to this end Oselli Engineering gas flowed the cylinder head and an R-Type Continental exhaust was fitted. Following the completion of the works, the car was carefully maintained and serviced to a very high standard. Recently a new dark green Mohair hood was fitted & the spectacular burr walnut woodwork refurbished to show standard. The car was also mechanically reviewed and prepared by Marque spcialists Frank Dale & Stepsons of West London. It is in close to concours condition & will do well anywhere it is shown. The boot lid has had modern Gas Struts fitted to ease in opening & closing it. 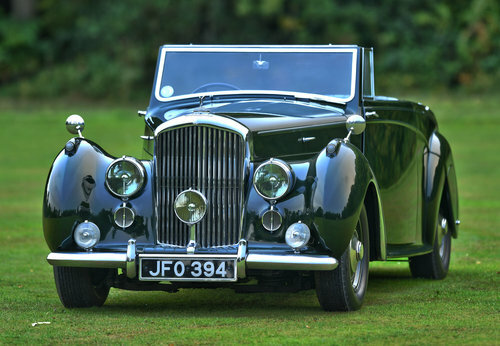 Presented in Brewster Green in show winning condition, this rare coachbuilt Bentley MkVI drophead comes with a complete selection of original small and large tools, and an extensive history file documenting the works carried out over the past 20 years. On the road it drives beautifully with notably more performance then a Standard Mark VI & a very long legged gait due to the 12.40 ratio rear axle. You really have to see & drive this car to appreciate how well it reflects the Monniker of "The Silent Sportscar." A gallery of large high-resolution pictures may be viewed on our website. 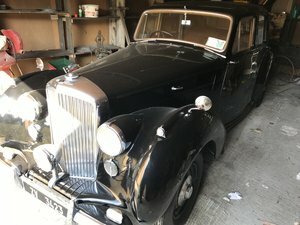 83917 miles 1951 Bentley MK6 Black & Cream coach work, complementing blue trim, new 4" Firestone white walls matching numbers all original car, a real pleasure to drive. Down sizing wedding car fleet have other classic vehicles for sale.